SURF RAKE beach cleaners are operated by one person from the seat of a towing tractor. They provide safe, fast, and efficient beach cleaning. Individually replaceable stainless steel tines mounted on a belt-covered bar flight conveyor then rake debris from the sand toward the adjustable moldboard deflector plate, removing surface and submerged debris with ease. As a result, refuse bounces off the beach cleaner's deflector moldboard and is deposited on the elevating portion of the conveyor , which transports the refuse to the hopper, while residual sand falls through the perforations in the conveyor. Finally, the hopper/bucket of the beach cleaner can be hydraulically raised and tripped to dispose of its contents into a truck or container up to 9 feet high. The S-belt is a perforated NRB Rubber belt with nylon layers that is practically wear-resistant and contains rows of mounted stainless steel tines. When the tines capture debris onto the beach cleaner's conveyor, the perforations allow residual sand to fall back onto the beach, allowing the beach cleaner to only remove debris. 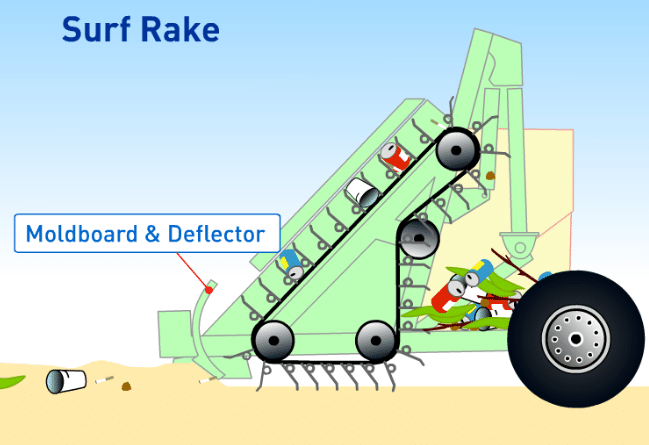 The SURF RAKE beach cleaner line features a hydraulic drive for smooth operation with major advantages . First, it provides excellent maneuverability. Power is transferred through a flexible hose, allowing the beach cleaner to clean while turning in the tightest of areas. Second, the beach cleaner's flow control permits fine adjustments of the conveyor belt speed, independent of the tractor. Third, the hydraulic drive maintains the operator's safety by eliminating exposed turning shafts. Fourth, the adjustable over-flow engages and resets automatically to protect our beach cleaners from oversized objects. Hundreds of tines mounted in offset rows rake through the sand every second, removing the unwanted debris. Accordingly, our beach cleaner machines are capable of capturing even the smallest objects from the sand such as glass, cigarette butts and pop-tops and depositing them in the hopper, leaving the sand cleaner, safer and more inviting. A new double torsion, three-coil stainless steel tine offers double the life, greater durability and improved resistance to corrosion in saltwater environments. Quality, durable and corrosion resistant components are important to any beach cleaner's operation. Tines are individually replaceable on each beach cleaner for simplified maintenance.